Winter doesn't mean you have to stop riding, but it does mean cooling down a horse takes longer. Cool downs can take much longer in the winter. Winter doesn’t mean you have to stop riding, but it does mean that more time is required for cool downs. It’s essential to dry horses off before putting them out in the cold. Here’s some tips! As you’re finishing up your ride, leave at least 15 to 20 minutes for walking. You may want to cover your horse’s hindquarters with an anti-sweat sheet, such as the Dura-Tech® Irish Knit Anti-Sweat Sheet ($44.99), to prevent a chill. Keep an eye on your horse’s respiratory rate. When their breathing becomes normal you can dismount. Have your cooler or anti-sweat sheet ready! Remove the saddle, but quickly cover your horse with the sheet. Don’t allow the wet saddle area to remain uncovered for too long. Double check your horse’s breathing. Continue hand-walking your horse if their breathing is still elevated. It’s a great idea to have a stack of old towels for around the barn. Toweling a horse off after a ride can speed up the drying process. You’ll still want to use the anti-sweat sheet though. Cool downs in the winter usually take more time. 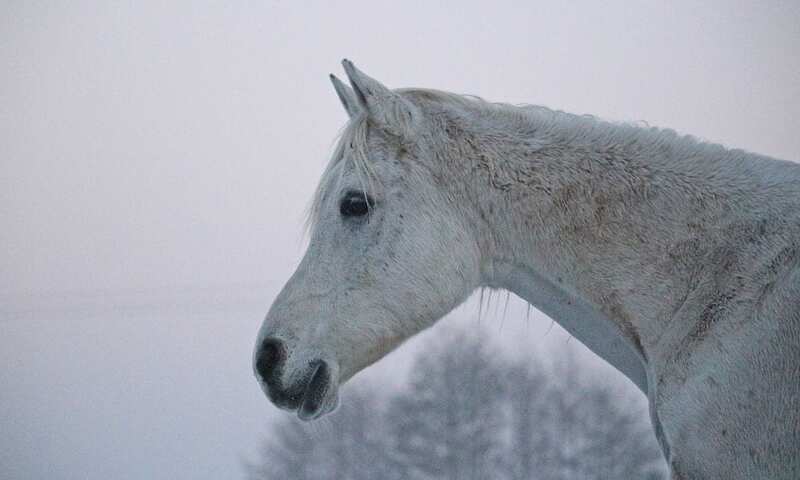 Give yourself half an hour to ensure your horse is dry and won’t catch a chill.